After the Great Tohoku Earthquake and tsunami, and ensuing crisis at the Fukushima Daiichi nuclear plant in March 2011, Japan issued stringent safety regulations and reviews that affected its entire 50-reactor fleet. It meant that as each Japanese nuclear reactor entered its scheduled maintenance and refueling outage, it could not returned to operation until restart was approved by both Japan’s Nuclear Regulation Authority (NRA) and the central government. Nuclear operators also need consent from governments of local prefectures. Between September 2013—when Ohi 3 and 4 were shut down—and August 2015, when Sendai 1 and 2 restarted, Japan’s entire reactor fleet went black. In 2013, though there was no consensus on how long the approval process could take, some industry observers forecast reactors under NRA review could be back online within a year. As of December 2018, only nine reactors had restarted. Sixteen others were under review by the NRA, where average review duration stretched beyond 1,000 days, owing to staffing issues. 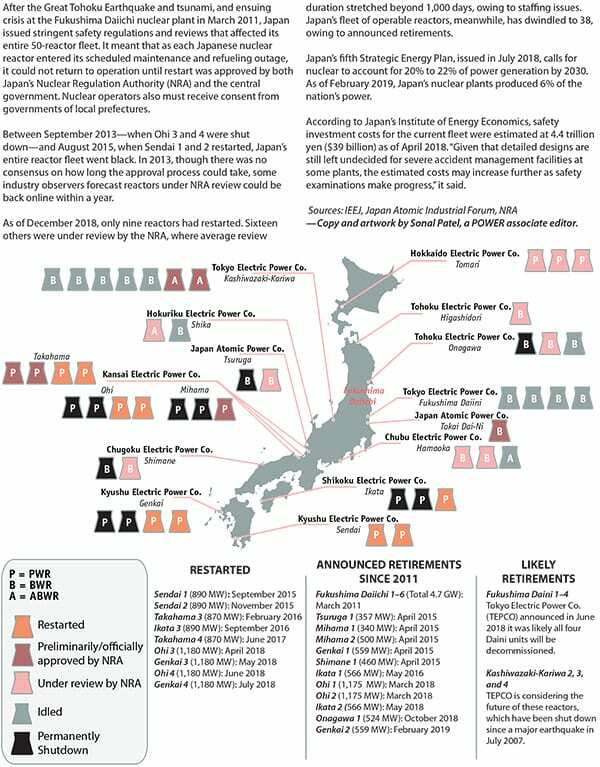 Japan’s fleet of operable reactors, meanwhile, has dwindled to 38, owing to announced retirements. ← Should a Power Company Be Held Responsible for Wildfires?